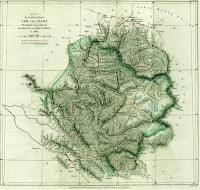 in July 1865 unequivocally depicts the northern border of Kashmir with Khotan in the area of the historic Hindutash pass in north eastern Kashmir, more-or-less on the crests of the Kuen Lun range not withstanding the fact that the map does not reflect the true findings pertaining to the survey of W.H. Johnson and does not depict Khushlash Langar as part od Aksai Chin. Colonel Walker who was the Surveyor General in 1867 “insisted that the map as published was far different from Johnson’s Original”. According to Dorothy Woodman author of "Himalayan Frontiers" writing on the issue of the customary boundary between India and Khotan, “the map" ( pertaining to the Survey by W.H. Johnson in 1865 ) "indicates that even in 1865 that area" (wherein Hindutash and Sanju are situate) "was part of India and that the customary boundary was well known”". In the words of Dorothy Woodman, “But for its accessibility, Aksai Chin might have been used as an alternate rioute for traders who could have thereby escaped the high duties imposed by the Maharaja of Kashmir. The Kashmir authorities maintained two caravan routes right upto the traditional boundary. One, from Pamzal, known as the Eastern Changchenmo route, passed through Nischu,Lingzi Thang, Lak Tsung, Thaldat, Khitai Pass, Haji Langar along the Karakash valley”(obviously via Sumgal) “to Shahidulla. Police outposts were placed along these routes to protect the traders from the Khirghiz marauders who roamed the Aksai Chin after Yaqub Beg’s rebellion against the Chinese(1864-1878)”. According to Ramsay, One Musa , nephew of the head–man (Turdi Kul) of the Kirghiz who marauded the area around the Shahidulla Fort and the Raskam sought help from the Chinese Amban at Yarkand. The Amban replied that “the Chinese frontier extended only to the Kilian and Sanju passes… he could do nothing for us so long as we remained at Shahidulla and he could not take notice of raids committed on us beyond the Chinese frontier”. Clearly, in 1889, the Kuen Lun was regarded as marking the southern frontier of East Turkistan. 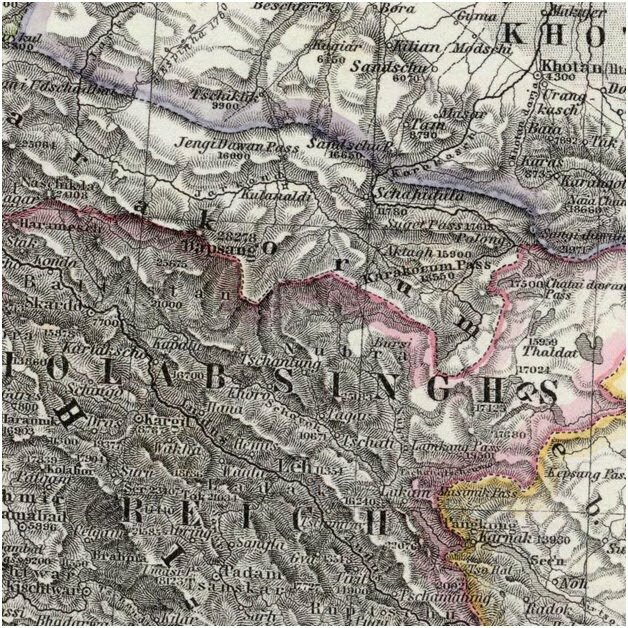 As Alder wrote, “the Chinese after return to Sinkiang in 1878, claimed up to the Kilian, Kogyar, and Sanju passes north of the Kuen Luen” . The Amban directed the Kirghiz to the authorities in Ladakh since no Chinese official ever comes to Ladakh. Musa was sent to Ladakh to ask for assistance, where he said, “The fort at Shahidulla belongs to the Kashmir state, but as it is at present in ruins, we desire to be given the money to rebuild it” Though, Ramsay later stated that Musa was not reliable and was altering his statements, it was confirmed that the Amban did say that the frontier was at the southern base of the Kilian pass in the Kuen Lun range, and that the Turdi Kol was “certainly told by the Chinese Amban that Shahidulla was not in Chinese territory” Younghusband arrived in Shahidulah on 21 August 1889 and met the Turdi Kol, the Kirghiz chief himself rather than Musa. Two Chinese officials , the Kargilik and the Yarkand Amban had told him that Shahidulla was British territory i.e. part of the territory of Kashmir. He also examined the Shahidullah Fort. The Gazetteer of Kashmír and Ladák compiled under the direction of the Quarter Master General in India in the Intelligence Branch and first Published in 1890 gives a description and details of places inside Kashmir and thus ipso facto also includes a description of the Híñdutásh Pass in north eastern Kashmir in the Aksai Chin area in Kashmir . The aforesaid Gazetteer states in pages 520 and 364 that “The eastern (Kuenlun) range forms the southern boundary of Khotan”, “and is crossed by two passes, the Yangi or Elchi Diwan, .... and the Hindutak (i.e. Híñdutásh ) Díwán”. The aforesaid Gazetteer of Kashmír and Ladák describes Khotan as “ A province of the Chinese Empire lying to the north of the Eastern Kuenlun range, which here forms the boundary of Ladák”. The Chinese Karawal or outpost, of Sanju was at the northern base of the Kuenlun, three stages from the pass of that name. Nevertheless, F.E.Younghusband could not disguise the objective fact that the Chinese considered the Kilian and Sanju Passes as the practical limits of their territory, although they ‘do not like to go so far as to say that beyond the passes does not belong to them….”. In 1893, Hung Ta Chen , a senior Chinese official had given officially a map to the British Indian Counsel at Kashgar. It clearly shows the major part of Aksai Chin and Lingzi Thang in India. Besides, in 1917, The Government of China had also published the “Postal map of China”, published at Peking in 1917. "It shows the whole northern Boundary of India more or less according to the traditional Indian alignments". Actually, an imperialist map of China during the relevant period, besides the depiction of Aksai Chin as part of India, the map incidentally depicts all the pre-1947 Himalayan princely states in Pre-1947 India including inter alia Nepal, Sikkim, and what is now Arunachal Pradesh as integral parts of India. The renowned German geologist visited Aksai Chin in 1927. He called it the westernmost Plateaux of Tibet’ because, he writes, ‘geographically the Lingzithang and Aksai-chin are Tibetan, though politically they are situated in Ladakh. “His journal reveals that there were no Chinese in this part of the country, and that it was indeed within the boundaries of India”. "I must confess", he wrote "that I have rarely seen such utterly barran and desolate mountains". It conveniently suited the English to arbitrarily treat the area in the Highlands of Kashmir between the Kuen Lun range and the Karakoram range as “no-man’s land”. Since India, unlike The America or Australia (where the English went out of their way in protecting the interests of their possessions) could not be colonized by Anglo-Saxons after exterminating the nationals, the English were least concerned or emotionally motivated about securing Kashmir’s historic and natural frontiers on the Kuen Lun and beyond. So as long as the Russians, who were out competing with the Chinese to grab as much of eastern part of Turkistan, an alien and foreign territory over which neither the Chinese nor Russians had an iota of claim, as possible, were not a threat to their rule in the rest of India, they did not care a damn if the Chinese encroached into the cis-Kuen Lun part of Kashmir. trans- Kuen Lun areas in the highlands of Kashmir , beyond their eastern Turkistan dominion “and had literally washed their hands of it”, prepared to unify Kashmir and the Wazir of Ladakh , Pandit Radha Kishen initiated steps to restore the old out post of Shahidulla, Ney Elias who was British Joint Commissioner in Ladakh and spying on the Government of Kashmir raised objections. “This very energetic officer’ , he wrote to the resident, who duely forwarded the letter to the Government of India, “wants the Maharaja to reoccupy Shahidulla in the Karakash valley ….I see indications of his preparing to carry it out, and, in my opinion, he should be restrained, or an awkward boundary question may be raised with the Chinese without any compensating advantage”. (italics mine to highlight) In the circumstances, since Elias had represented to the Supreme Government, it was a relatively simple matter for him to ensure that the plans were dropped. He told the Wazir that he had reported against the scheme to the Resident, and pretty soon the subservient Wazir succumbed and assured him that he did not intend to implement it. Elias was also promptly meticulously backed up by the Government of India. A letter dated 1st September was sent to the officer on Special Duty (as the Resident was called before 1885) instructing him to take suitable opportunity of advising His Highness the Maharaja not to occupy Shahidulla”. Elias had already killed the proposal. Thus, the English after treacherously perniciously successfully preventing the reunification of Kashmir vis-à-vis the outpost in the Shahidulla area in Kashmir and the natural and historic border of Kashmir on the Kuen Lun range and beyond, by vehemently opposing it at a time when the Chinese were least concerned or bothered of the alien trans- Kuen Lun areas in the highlands of Kashmir , beyond their restive eastern Turkistan dominion “and had literally washed their hands of it”, rather than as much as supporting the endeavour much less aiding it, prevented the unification of Kashmir. Kashmir, however never forfeited her territorial integrity, though she had been under duress and coercion prevented from restoring the outpost at Shahidulla to command the Kuen Lun. Thus, after successfully preventing the reunification of Kashmir, when the Chinese encroached into Kashmir in 1892 and illegally placed an alleged boundary mark pillar deep in Kashmir along with a board which stated that “this board is under the sway of the Kakan, the Chinese Emperor, “the distance was taken from Shahidulla, which was the limit of Kashmir territory, Raja Sir Amar Singh in his letter of 2 November,” described this action as ‘a transgression of Khatais (Cathays) over the Ladakh boundary. The Kashmir State has no intention of making any encroachment on foreign territory, but I hope you and the Government of India will enable (i.e. assist) it to maintain the territory already acquired and in its possession, and in that case, the unlawful aggression of the Khatais must be repelled , and the original boundary restoured”, The Wazir Wazart of Ladakh, complained to the Vice- President of the Jammu –Kashmir State Council of the Chinese Amban who had constructed the Pillar. The Wazir said that as far as he had been able to ascertain, his own frontier was considered upto Shahidulla, 16 stages from Ladakh, where one of his predecessors had built a fort which was still standing. This proved, he added “the state frontier extends to that place”, the English did nothing of the sort and betrayed the Government and people of Kashmir. As a matter of fact, the English had surreptitiously illegally decided that “the Indus watershed should be considered as the boundary of the Kashmir territories to the north”, vide the instructions of the Government of India of 21 August 1890 stealthily sent to the Resident’s predecessor, Nisbet, and asked the Resident to convey this to the Durbar and the Joint Commissioners in Ladakh. But Nisbet had either deliberately or accidently done what deserved to be done with the instruction, either keep the instructions to himself or better still destroy it! The English were hand in glove with the Chinese in their occupation of the areas of Kashmir between the Kuen Lun range and the Karakoram. The statement of John Lall author of “Aksaichin and Sino-Indian Conflict” at page 95 that , “Considering that the State’s officials abandoned Shahidulla as long ago as 1867, the Raja’s assertion that it was in their possession was a flight of fancy”, is a misrepresentation per se and a lie that needs to be refuted. First Mr. John Lall, The State of Kashmir never abandoned the Shahidulla outpost commanding the Kilian and Kathaitham areas in northern Kashmir and the Kuenlun range in 1867 as claimed by you. As late as in 1885, at a time when the Chinese were least concerned or bothered of the alien trans- Kuen Lun areas in the highlands of Kashmir , beyond their eastern Turkistan dominion “and had literally washed their hands of it”, the Government of Kashmir prepared to unify Kashmir and the Wazir of Ladakh , Pandit Radha Kishen initiated steps to restore the out post of Shahidulla, but this legitimate act had been opposed slyly by the English who even if they did not support it, even if they did not aid it, could have at the least ignored the endeavour as none of their business to decide for the Kashmiris where the northern border of their state, was! And desisted from objecting to the endeavour. So Mr. John Lall, you are required to refrain from lying and making misrepresentation to suit your perverted mindset and whims and fancies. Facts are facts and nothing can change them. Neither you, nor any one of your lot! “What”, if one asks the Hypothetical question, “if the English government had not opposed the endeavour of the Government of Kashmir to reunify Kashmir?” The English, if they did not support it, even if they did not aid it, could have at the least ignored the endeavour as none of their business to decide for the Kashmiris where the northern border of their state, was! And desisted from objecting to the endeavour. The practical authority of the Chinese, as Ney Elias and Younghusband consistently maintained, had never extended south of their outposts at Sanju and Kilian along the northern foothills of the Kuenlun range. At that time, when the Chinese were least concerned or bothered of the alien trans- Kuen Lun areas (trans- Kuen Lun from the East Turkistani side and cis- Kuen Lun from the Kashmiri side) in the highlands of Kashmir , beyond their restive eastern Turkistan dominion “and had literally washed their hands of it”, the Kashmir would have easily reunified Kashmir vis-à-vis the outpost in the Shahidulla area in Kashmir and the natural and historic border of Kashmir on the Kuen Lun range and beyond at Kilian, Kathai Tam and Sanju areas in Kashmir. Once the Government of Kashmir consolidated the unification which was the easiest thing given the absence of imperialist adversaries, the Chinese would never ever have even considered or harboured the very idea or notion of controlling an area beyond the natural frontiers of their restive dominion along northern foothills of the Kuen Lun range as stated by Ney Elias , “they told me that they considered their line of ‘chatze’, or posts, as their frontier – viz. , Kugiar, Kilian, Sanju, Kiria, etc.- and that they had no concern with what lay beyond the mountains”. The subsequent incident of planting an alleged border pillar by the Chinese deep inside the territory of Kashmir would never have occurred. The Chinese were given a carte blanche and an invitation to trespass into Kashmir by the act of the English in opposing the unification of Kashmir and conspiring with the Chinese, and once they got a foothold in Kashmir their imperialist designs were facilitated manifold giving result to all the present plethora of border troubles and further facilitating the hostile anti-Indian cartographers like the notorious hostile Times Atlas in their endeavour to go berserk in their experiments to draw various anti-Indian maps! According to the Schwartzberg Atlas, A historical atlas of South Asia, The Times Atlas had previously published a map which depicted the Hindutash pass in Ladakh as part of Kashmir in its 1900 edition. And the whole of the Sub-continent of India is suffering today due to the wanton mischief indulged by the English then. This is a wake up call for the People of India and Paksitan and the rest of the sub-continent of India. The English may purportedly support one side against the other, but are they really supporting a side? They are just playing off one side against the other and indulging to attain their nefarious designs. We south Asians should be weary of them and see through their nefarious designs and treat it with the contempt it deserves. At the end of the day, reunification of India is the only solution. Unfortunately the Government of Kashmir succumbed to the English threats and intimidations in the year 1885 and did not implement the endeavour immediately but kept it pending and delayed it though the Government of Kashmir never forfeited the sovereignty of Kashmir over the Shahidulla out post area extending to Kilian pass and Kathaitham as was reiterated by Raja Sir Amar Singh in his aforesaid letter of 2 November, and the English having opposed and sabotaged the endeavour were required and were bound to protect the territory of Kashmir when in the first place the Chinese encroached into the area and placed alleged border pillars as a result of the deliberate nefarious and willful act of the English and the English were entirely responsible for the encroachment and were liable and bound to redress the situation and restore the status quo anti , but the English had been all along hand-in-glove with the Chinese and covertly conspiring with the Chinese to cheat and betray the Government and people of Kashmir and had surreptitiously and stealthily in collusion with the Chinese already taken a decision for the People of Kashmir that “the Indus watershed should be considered as the boundary of the Kashmir territories to the north”. However, even the English could not escape from the inevitable fact that the northern border of Kashmir extended to the crests of the Kuen Lun range and beyond. Viceroy Hardinge had written to the Secretary of State for India on September 12, 1912:, “The following would be a good line: From Beyik Peak, where the line would start, eastwards to Chang pass, Dehde (Dafdar?) and Taghdumbash being left on our side; thence through Sargon pass along crest of (Kuen Lun )range, and so to crest of Kuen Lun range north of Raskam after crossing the Yarkand river; thence along crest of Kuen Lun range to Sanju or Grim pass via the passes named in the map of 1891,” (“reference is invited to map prepared by Survey of India in 1891 to illustrate explorations of Capt. Younghusband”) “viz: Kukahang,(Kukalang?) Dozaki, Yargi,” (Yangi to the north of Kulanaldi?) “and Kilik; thence along Kuen Lun watershed” (via obviously the Hindutash pass) “to frontier of Tibet crossing Karakash river,” ( obviously in the vicinity of Ali Nazar) “the plain of Aksai Chin left on our side of the frontier”. F.D., 535/15 Enclosure in No. 208. Kashgar. September 12, 1912. When Kashmir acceded to the rest of India , the territorial integrity of Kashmir vis-à-vis the Kathai Tam and Kilian and the rest of the Kuen Lun range in Kashmir wherein are the Hindutash and Kukalang passes in Kashmir remained intact and un-forfeited despite the crooked mechanisms of the English. Dafdar the northernmost part of Kashmir bordering the former Russian Empire turned “U.S.S.R.” continued to be part of Kashmir. To quote Nehru himself from his telegram dated 26 October, 1947 to the British Prime Minister, Clement Attlee, he says, "Kashmir's Northern frontiers, as you are aware, run in common with those of three countries, Afghanistan, `the Union of Soviet Socialist Republics' and `China' ". Also, the Maharaja Hari Singh states in his correspondence with Lord Mountbatten dated October 26, 1947, “Besides, my State has a common boundary with ‘the Union of Soviet Socialist Republics’ and with ‘China’ ” It was this territorial integrity of Kashmir which was recorded and preserved in the Constitution of India after the independence of India in Entry 15 in the First Schedule of the Constitution of India. Entry 15 reads “The territory which immediately before the commencement of this Constitution was comprised in the Indian state of Jammu and Kashmir”, and thankfully, the same continues to this date with out any obnoxious and illegal amendment. If these are true facts this is shameful and unfortunate that Indian leadership lacked courage and wisdom to deal with pre or post independence issue in such a callous manner. If these are ture facts this is a shame to see Indian leadership pre independence or post independence dealing with such important issues in such callous manner.